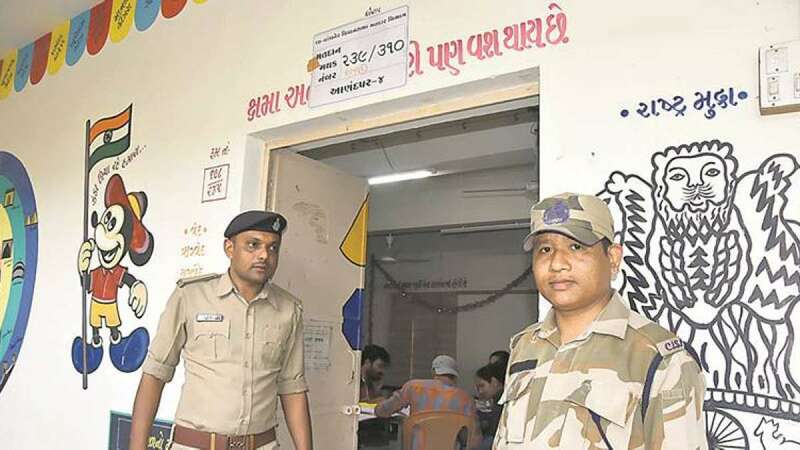 Ahmedabad : Gujarat is all set for Saturday's first phase of Assembly elections in which 977 candidates will battle it out to get elected from 89 of the 182 constituencies, with the ruling BJP facing a strong Congress challenge. The 89 constituencies are spread out in the 19 districts of Kutch, Saurashtra and southern regions. High-pitched campaigning, involving among others Prime Minister Narendra Modi, ended on Thursday evening. Of the 89 seats, the ruling Bharatiya Janata Party holds 67 and the Congress 16. One seat each is held by the NCP and JD-U while independents hold the remaining two. The most striking battle on Saturday will be in Rajkot West, presently held by Chief Minister Vijay Rupani. He is being challenged by Congress candidate Indraneel Rajyaguru, the outgoing MLA from Rajkot East. Another outgoing Congress MLA, Paresh Dhanani, from Amreli is challenged by a former Congress leader and now BJP MLA -- in Lathi constituency. The Saurashtra region will see some more high profile battles involving cabinet minister Babubhai Bokhiria, Arjun Modhwadia of Congress and former Finance and Power Minister Saurabh Patel. The Congress has tried to woo the voters with a manifesto. The BJP released a 'Sankalp Patra' or 'Resolution Letter' on Friday. The polling on Saturday will begin at 8 a.m. and end at 5 p.m. There are a total of 24,689 polling booths. Of the 2,12,31,652 voters, 1,11,05,933 are males and 1,01,25,472 females while 247 are from the third gender. There are eight seats with more than 16 candidates. The maximum of 27 are in Jamnagar Rural seat. There are just three candidates each in Jhagadia and Ganadevi constituencies, both Scheduled Tribe seats. Wherever there are more than 16 candidates, two ballot units will be put up. On the seventh and last day of campaigning on Thursday, Modi, BJP President Amit Shah, Rupani and Uttar Pradesh Chief Minister Yogi Adityanath addressed several public meetings. The main face of the Congress campaign has been Rahul Gandhi. The Patidar Anamat Andolan Samiti (PAAS), which has been agitating against the BJP government for more than two years, has been asking people not to vote for the saffron party, a subtle message to vote for the opposition.